Competition for the limited seats in NYC’s Gifted and Talented (G and T) Program is fierce. The entrance exam is administered by the NYC Department of Education (DOE) to children entering kindergarten through third grade, and admission is based solely on the results of this exam. To get into G and T NYC, your child will need to score in the 90th percentile. To qualify for the most coveted positions in a citywide G&T program, a score in the 97th percentile is required. However, spaces are so limited that typically only children in the 99th percentile are placed in these programs, and even some of these students are turned away. With such intense competition, how can you help give your child the best possible chance of admission? Here we discuss what to expect from the test, how to prepare, and tips to boost your child’s confidence. The test is divided into two sections pulled from two widely-used assessments, each worth 50% of your child’s score. The Naglieri Nonverbal Ability Test® (NNAT®2) tests problem-solving and reasoning abilities with nonlinguistic test questions. What does that mean? 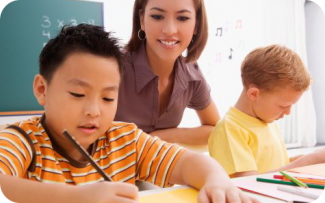 Basically, your child will answer questions relating to figures, shapes, symbols, and patterns. All objects and shapes on the test appear in blue and yellow, and each question offers five answer choices. There are four types of questions on the NNAT2: pattern completion, reasoning by analogy, serial reasoning, and spatial visualization. For more information on the NNAT2, including sample questions, visit this page. The other component for admission to G and T in NYC is the Otis-Lennon School Ability Test® (OLSAT®). The OLSAT measures verbal comprehension, verbal reasoning, pictorial reasoning, figural reasoning, and quantitative reasoning. Both verbal and nonverbal questions are included on the test. The content, structure, and time limit of the test varies according to grade level. Most students take written tests, but OLSAT questions are read aloud to Pre-K and Kindergarten students, and these questions can be read aloud only once. For in-depth information about the OLSAT, head to this page. The OLSAT and the NNAT2 contain questions that will probably be strange and unfamiliar to your child. Practicing these question types as often as possible is the best way to increase your child’s chances of success. Your child will gradually become more familiar with the questions and more confident in her ability to answer them correctly. Test anxiety can ruin a student’s ability to succeed on an exam, so building confidence through frequent practice is a must. Begin practicing as early as possible so these question types become almost second nature. Start out with untimed practice, then begin working under time constraints once your child is more comfortable. Eventually, have your child take at least one full length practice test to build focus and stamina. Also have your child answer questions that are read aloud in order to practice auditory processing and retention for the OLSAT. For a young child, practicing 15-30 minutes a day is reasonable. An older child may be able to practice longer. You can find sample questions for both tests here. As your child completes practice questions, take the time to discuss incorrect answers. Learning won’t occur unless your child understands what questions she missed and how to find the correct answer. For each missed question, go over the correct answer and explain why the answer is correct to your child. Even better, gently guide her into coming up with the explanation herself. Once you’ve had more time to evaluate your G and T NYC hopeful, you can determine areas of strength and weakness for your child. As test time draws closer, focus on the areas of weakness. Work with your child to understand why these particular question types are a struggle, develop strategies to address these struggles, and practice as much as possible. Confidence is key when it comes to successful test-taking. Even the most intelligent student cannot perform well if she is stressed, anxious, and overwhelmed. We’ve already mentioned developing your child’s confidence through frequent practice, but there are other strategies you can use too. Even if your child is having a poor practice session, praise and encourage her. No matter how anxious you feel about the big test, do not convey this anxiety to your child. Instill the idea that your child can and will pass this test if she focuses, works hard, and believes in herself. This attitude will equate to better performance. Also consider a way to reward progress. For example, if your child begins correctly answering questions she’s struggled with in the past, take her to get ice cream. Reward your daughter with a pedicure if her practice sessions show improvement, or cook your son his favorite meal. Keep your sessions as fun and positive as possible, and allow your child to feel a sense of accomplishment and pride. Teach your child general test-taking strategies, like taking a deep breath and looking at the question a second time if she feels like she doesn’t understand. You can also teach your child to use process of elimination and make educated guesses. Consider giving your child a lucky trinket, like a penny or a marble, to keep in her pocket and touch for reassurance if she gets nervous or overwhelmed. It may seem silly, but it can help your child feel comforted and calm when you aren’t there to soothe her. Follow the tried and true testing tips: Make sure your child gets a good night’s sleep before the test, and provide a meal that’s nutritious and filling. Don’t wait until the last minute to cram in information. This will most likely make your child nervous, and cramming is not as effective as repeated exposure over a long period of time. Find out as much information about the test as possible. The more you know, the more you can ensure your child is confident and prepared. For in-depth information about the admissions test for the G and T in NYC, head here. Make sure your child knows that regardless of the test results, you will still love her and believe in her. Young children can get very anxious and afraid of failure when taking high-stakes exams, so it’s important that she knows you’re in her corner no matter what. Learn as much about the test as possible using the resources we’ve provided here, and have your child work on practice questions early and often. Discuss incorrect answers, work on areas of weakness, and build your child’s confidence by celebrating success. Talk to your child about general test-taking strategies, and do everything you can to ease test anxiety. If you follow these tips, your child will have a better shot at being accepted into G and T NYC! If you would like to have your child start practicing, click the button below to receive 25 free practice test questions based on the OLSAT and NNAT.